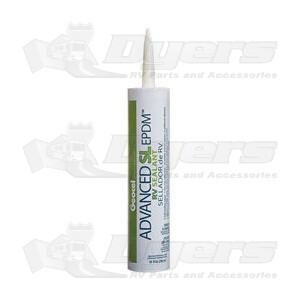 Geocel ADVANCED SL EPDM RV Sealant is a premium one-component, proprietary self-leveling sealant designed for use in horizontal applications on an RV. The advanced technology results in a sealant that provides a durable fix for RV EPDM (white) roof repairs without damaging or swelling the white EPDM membrane. Geocel ADVANCED SL Sealant creates a secure secondary seal along roof edges, pentration vents, air vents, and screw heads. Do not use on TPO membranes or on black EPDM. Do not use on vertical surfaces. Applications to plastic may require a primer. Do not use in areas where food is processed or stored. Do not use for potable water applications. *This product can not be sold and or shipped to California. White EPDM, metal, and other pre-fabricated sheet goods. Will not harm or swell EPDM membrane. Adheres to white EPDM, metal, and other pre-fabricated sheet goods (not for use on TPO).